Did you know the nervous system begins to develop just two and a half weeks into gestation? By the time your baby is born, it’s been through the traumatic birthing process that can affect nervous system health. 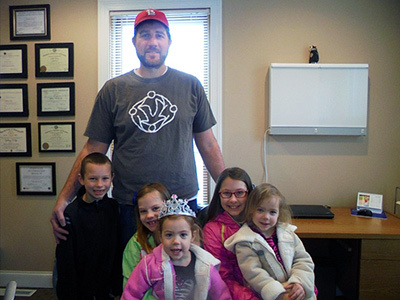 Kids love being adjusted by Dr. Jeff! C-sections are on the rise, and even in the most natural of births, babies can have subluxations that interfere with their natural healing abilities. In a c-section delivery this process alone applies 60 pounds of pressure on your baby, and there is a chance of injury just as there is for adults. It’s increasingly common that kids are affected by allergies that can trap them in their house, unable to go outside and being miserable for a good part of the year. Dr. Jeff offers Allergy Sensitivity Therapy, which identifies the substances that bother your child. We can then work to relieve these sensitivities, allowing your child to enjoy life without being held back by allergies. Every child deserves the best possible chance at proper growth and development. Help your kids thrive with natural health care. Contact us today!